An Afternoon with The Blue Angels: The Angels FLY! In fact we both have our mouths so wide open that we could have swallowed the F-16 landing shortly after Fat Albert's take off! Scarcely over the spectacle of this take off by the Blue Angels support aircraft, our attention is diverted to our left by the sound of the six Hornets coming our way. While Lt. Verissimo introduces the Angel pilots on the public address system, the aircraft pass by in pairs. Thumbs up and good luck hand signs directed to the Blue Angels crewmembers, by possibly the best aviators in the world. We can not help waving our hands too, feeling like kids again, dreaming of flying these elegant and powerful aircraft. While the six Blue Angels taxi to their takeoff position, the narrator tells us more about the F/A-18 Hornets flown by the United States Navy Demonstration Squadron. 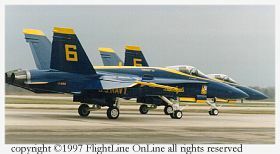 The Blue Angels fly the F/A-18 A/B models, and have done so since 1987. Two GENERAL ELECTRIC F404-GE-400 low-bypass turbo fan engines providing some 32,000 pounds of thrust power each aircraft.. It is 56 feet in length with a wingspan of 40 feet. It is more than 15feet high. The Hornet can reach speeds in excess of Mach 1.7. These six aircraft fly only for peaceful missions and have had their guns removed. A cloud of dust and smoke gushes around the first Hornets packed tightly in takeoff formation. Afterburners engaged, the blue arrows rapidly approach, surrounded by a powerful roar, so intense that it seemingly rips the clouds open letting in the sun for a brief moment, basking us in some much needed warming rays. We rapidly loose sight of the formation but Lt. Verissimo bring our attention back to the end of the tarmac for the takeoff of Blue Five, Angels lead opposing solo. Afterburners engaged, Lt.Ryan Scholl's Hornet gains speed for a few seconds. The nose slowly lifts up, the beautiful jet begins climbing smoothly.....then, in a surprise move that makes us expel a loud "wow!" 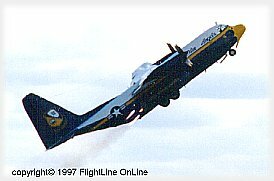 (In fact, it was one of those very Quebecois French words that decency will prevent me from writing here:-) Just a few feet up in the air, Lt. Scholl executes a snap roll that brings the right wingtip very close to the ground. After this daring and very precisely executed maneuver, Blue Five enters in a steep AOA climb, rapidly disappearing into the low cloud cover. All present have goose bumps on our arms that have nothing to do with the brisk temperatures! This practice performance by the Blue Angels was absolutely tremendous. We will give you a full description of the sequence in a special feature in an upcoming update of FlightLine. So impressive was the Angels low show we witnessed this day, we hoped even more to be able to see their high show.......the weekend is young.....and far from over...looking at the gloomy sky overhead..... we cross our fingers! But this day's excitement is not yet over..... After the demonstration team lands, all maintenance crewmen leave to service the aircraft, except for JO2(SW) Dave Fitz, from the Blue Angels Public Affairs Office, who comes to see us. "Sir, you will be able to meet Lt. Scholl, our Lead Solo, in about ten minutes." Head spinning in anticipation of what is to come, I babble a soundless thank you. I was to have an interview with the Navy pilot who had just nearly given me a heart attack! I was to meet one of the finest pilots the United States Navy have to offer! Pierre-Mathieu and I were already running to our car in order to get to the aircraft.